The DPB microcontroller is programmed for use with a Excelitas® PYD1798 digital pyroelectric infrared sensor to detect infrared radiation (IR) from a moving human or animal both in daylight and at night. The PYD1798 sensor will only respond to a moving source of infrared radiation; It will not detect a static IR source. User programming can be done for special applications that require different sensitivity, output on time (dwell) or operating mode. Programming is easy with external resistors. The DPB is available in both 8 pin SOIC for surface mounting and in 8 pin PDIP for plugging into a DIP socket. 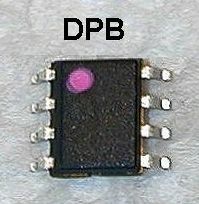 Order DPB-S for a surface mount package or DPB-P for a DIP package. The Excelitas PYD1798 pyroelectric infrared sensor is a Digital infrared detector. This new technology incorporates a sensor, amplifier, filter, A/D converter in one TO5 package. This sensor must be used with a microprocessor. Unlike typical analog pyroelectric sensors, the digital sensor outputs serial data pulses that represent the amplitude of detected infrared radiation digital form. Since all of the amplification and signal processing is done within the sensor package, the detector has very high immunity to RF radiation from cell phones and other sources. Below is a block diagram of the DPB microcontroller showing pin connections for both SOIC and PDIP packages to be used with a PYD1798 sensor. The microcontroller decodes the serial bits from the sensor and turns an output on when motion is detected. The amount of time that the output remains on (dwell) can be programmed for one of ten dwell times from 200 milliseconds to 10 minutes. Detection sensitivity that affects detection range can be programmed to one of ten sensitivity levels. The DPB is supplied with default settings of medium sensitivity, 1 second dwell time and retriggerable mode. The figure below shows typical components and wiring. A basic motion detector circuit has only four components. 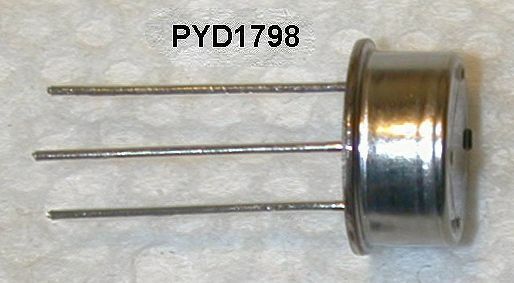 A PYD1798 sensor, DPB microcontroller, 0.1 microfarad bypass capacitor and 10K 1% resistor that provides pull-up current for the P3 programming input. and view or print a complete manual for the DPB-PYD components. Manual includes functional description and application diagrams.